Saint Francis of Assisi was born in 1181 in the Italian hilltop town of Assisi. His father, Pietro di Bernardone, was a prosperous silk merchant, and his mother Pica de Bourlemont, was a noblewoman from Provence. Saint Francis was originally called Giovanni, but his father later renamed him Francesco because of his successful business dealings in France and his admiration for all things French. After leading the ordinary (somewhat dissolute) life of a wealthy young man of that period, Saint Francis underwent a religious conversion, following which he renounced his inheritance and embraced a life of poverty and service. Although not ordained as a priest, he began teaching what he believed to be the true Christian message. He soon acquired a small group of followers, and he traveled with them to Rome to ask Pope Innocent III for permission to found a new religious order. 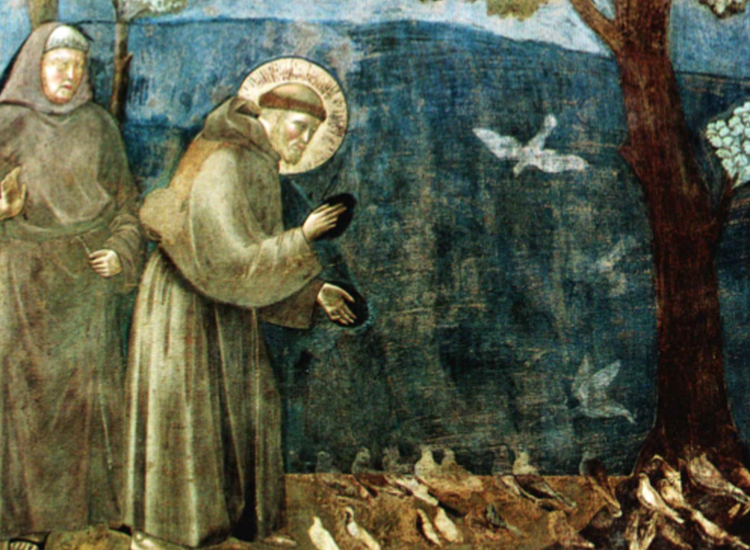 During his life, Saint Francis founded three religious orders. “Of you, Most High, he bears the likeness. and serve Him with great humility”. Pope Gregory IX canonized Francis on 16 July 1228. Along with Saint Catherine of Sienna, he was designated Patron saint of Italy. He later became associated with patronage of animals and the natural environment, and it became customary for Catholic and Anglican churches to hold ceremonies blessing animals on his feast day of 4 October. Saint Francis, friend of all life on earth, friend of the earth itself, true interpreter of Christian ethics, we need your voice today!